Cut cauliflower into big florets and soak in warm water with salt for 10-minutes.After 10 minutes put in the strainer. Take oil in a kadai, add onions and green chillies. Fry till pink colour.Add ginger and garlic paste and saute till raw smell of ginger and garlic paste goes. Then add curd and put the flame in low and saute for 3-4 minutes.Then add tomatoes and fry till oil separates. Add coriander powder,cumin powder,turmeric powder and red chilly powder.Saute for another 1 minute. Now add cauliflower and sprinkle salt.Mix thoroughly.Cover and cook till cauliflower are soft and the curry is dry. Serve hot with rotis or as a side dish with rice. Nice curry to go with garama garam parathas. Delicious recipe saritha! 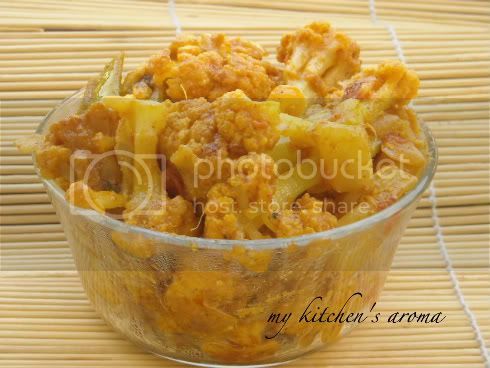 I love cauliflower sabzi.... I follow a similar recipe but don't add curds when I make it dry... for the gravy cauliflower curry, I add curds. Wow that's really a yummy curry, never added curd! 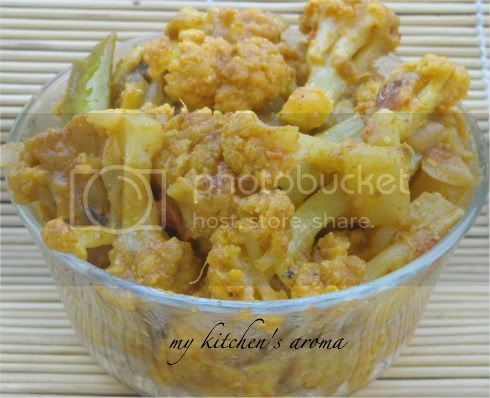 Delicious curry, never tried gobi with yogurt, will try out soon..
yum! I am sure they were great! Looks so yum! Slurpy dahi gobi! My daughter's fav.